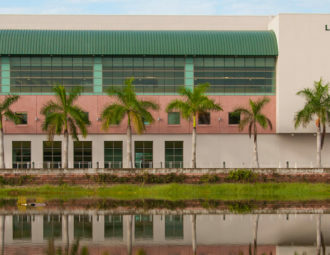 Located in the midst of Florida's complex freshwater and saltwater systems, The Water School is uniquely positioned to explore water-based issues. The health of waterways impacts surrounding ecosystems, regional and state economies and people who rely on water for life and leisure. By taking a leadership role in this vital arena, FGCU acts as a catalyst for change in our community and throughout the world. 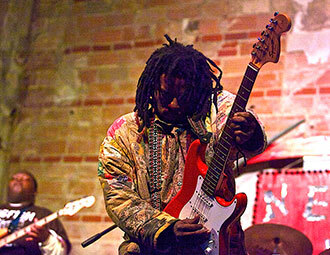 The event was March 22 and attracted attention nationwide. Hear President Martin's remarks. Feature state-of-the-art research and learning facilities where students receive the professional preparation they need to tackle real-world problems. Bring together all water-focused faculty from the marine and ecological sciences, biology, engineering and business fields. Integrate our off-campus facilities that provide access to the Gulf of Mexico, estuaries, rivers and the Everglades. Draw in local, national and international partners and open the doors to new partnerships. Conduct outreach and education programs in our local communities so that we help create a more water-literate society. Empower FGCU to claim its rightful place as a leading, independent source of environmental and scientific knowledge. Take the lessons we learn here and apply them throughout the state, nation and world. The environment provides ecosystem services that benefit people. Understanding how our waters – and water problems – affect human health is a critical focus. Habitat loss and other factors upset the balance of ecosystem integrity. Rising sea levels, changing weather patterns and dying coral reefs impact Florida. 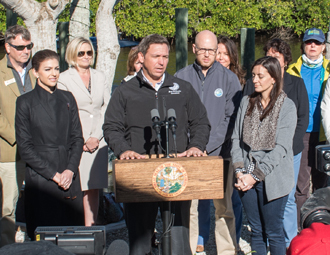 Florida is a water-lover's paradise — how can we ensure that for the next generation? Want to be an agent of change in the world as the global community faces challenges like energy crises, water shortages and climate change? FGCU graduates its 100th graduate student in Environmental Science. FGCU graduates its 200th student in Marine Science. Report from Steering Committee regarding establishment of a School of Integrated Coastal and Watershed Studies at FGCU. FGCU graduates its 500th undergraduate student in Environmental Studies. Partnership agreement between FGCU Dept. Marine and Ecological Sciences and University of Brest, Doctoral School in Marine Science (EDSM) granting Dept. Marine and Ecological Science host laboratory status. Agreement allows students earning doctorates at EDSM to be co-supervised by FGCU Marine and Ecological Science graduate faculty and carry out part of their research at FGCU. Partnership agreement with Estero Bay Aquatic Preserve. Promotes cooperation in undergraduate and graduate education and collaboration on research efforts. FGCU graduates its 100th undergraduate student in Marine Science. FGCU graduates its 50th graduate student in Environmental Science. Moonlight on the Marsh Distinguished Lecture Series. Annual series open to public bringing experts from around world to Southwest Florida to talk about wetland restoration and water issues. Naples Botanical Garden. Park’s mission is to provide teaching, research, and service related to wetland, river, and coastal science and ecological engineering by understanding how wetlands function and if and how we can create and restore them. FGCU graduates its 250th undergraduate student in Environmental Studies. Partnership agreement for Scientific and Educational Cooperation with Université de Bretagne Occidentale (University of Brest, France). Promotes academic and scientific exchange in areas of common interest. Opening of Seidler Hall, the second designated science building on campus. Seidler Hall becomes first building on campus to be certified Platinum—the highest level—by U.S. Green Building Council (Leadership in Energy and Environmental Design). Master of Arts in Environmental Studies degree offered for first time. Program provides students with professional experience by requiring a professional internship with local agency or environmental organization. Program also permits currently employed environmental professionals to adopt professional responsibilities into internship. Partnership agreement for Scientific and Educational Cooperation with College of Natural Sciences, University of Bangor, Wales. Cooperative agreement to advance research in marine and environmental science and exchange of academic and scientific knowledge. Congressional grant from U.S. Department of Education to investigate effects of altered freshwater in Caloosahatchee River on estuarine production. South Florida Water Management District grant awarded to investigate effects of altered freshwater inflow in Caloosahatchee River and Estuary on plankton communities and water quality. South Florida Water Management District grant award to establish first long-term oyster-reef monitoring program in Southwest Florida. 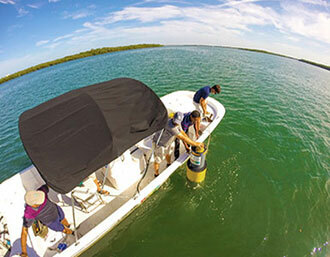 Vester Marine and Environmental Science Research Field Station established in Bonita Springs. Mission is to facilitate educational programs, community involvement, and research that increases understanding and promotes stewardship of coastal watersheds, estuaries, and Gulf of Mexico ecosystems. Marine & Ecological Sciences faculty presented with Coastal Partnership Award for its efforts in oyster-reef restoration. Partnership agreement with Conservancy of Southwest Florida to create Environmental Education and Outreach Program in Southwest Florida. FGCU graduates its 100th undergraduate student in Environmental Studies. Partnership agreement with Florida Department of Environmental Protection to provide support for its Coral Reef Conservation Program. South Florida Water Management District grant awarded to investigate use of tidal tributaries of Estero Bay by larval fishes, crabs, and shrimps. Master of Science in Environmental Science becomes first graduate degree in natural sciences. Program prepares students for careers as environmental professionals or for further graduate studies. First Congressional grant from U.S. Environmental Protection Agency in support of research related to coastal watersheds in Southwest Florida. 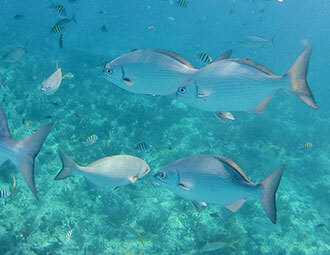 First Florida Institute of Oceanography grant award to take students to Florida Keys (Keys Marine Lab, Long Key, Florida) to study coral-reef and mangrove ecology. Students gain hands-on experience collecting and analyzing environmental data. Keys trips are now important element of Marine Science curriculum at FGCU. FGCU extends oyster reef and water quality research into Ten Thousand Islands through grant from South Florida Water Management District. 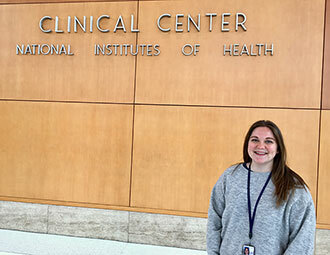 Marine Science major replaces Earth Systems Science from which it developed. Program prepares students for jobs in science and technology, in the environmental field, and as educators in natural and environmental sciences, and for further graduate studies. FGCU begins first of many community-based oyster-reef restoration projects in Southwest Florida. Funding partners include Charlotte Harbor National Estuary Program, National Marine Fisheries Services, National Fish and Wildlife Foundation. Opening of Whitaker Hall, the first dedicated science building on campus. First Congressional grant from U.S. Department of Education to support center for environmental research and preservation and to expand Campus Ecosystem Model for undergraduate education. Partnership agreement with Sanibel Captiva Conservation Foundation to promote environmental education and provide career guidance to FGCU students. First South Florida Water Management District grant award to investigate impact of altered freshwater flow in Caloosahatchee River and Estuary on oysters and associated organisms. First Florida Institute of Oceanography grant award to take students to sea on state oceanographic research vessel and gain hands-on experience collecting and analyzing environmental data. Cruises are now important element of Marine Science curriculum at FGCU. First National Science Foundation grant award to acquire research-grade instruments in support of Campus Ecosystem Model. FGCU purchases modular unit to house new instruments, thus creating the University’s first science research laboratory. First Florida Sea Grant award in support of Elise B. Newell Seminar series to bring noted speakers to FGCU. Seminars have since brought experts from around country to Southwest Florida to stimulate research and inform local communities about issues of environmental concern. Campus Ecosystem Model for undergraduate education. With FGCU campus as focus for study of entire watershed, Model provides a context for incorporating interdisciplinary teaching, research, and collaborative and active learning—all highly effective practices in undergraduate education. First Charlotte Harbor National Estuary Program grant award to develop techniques that assess health of tidal tributaries in Estero Bay. FGCU opens on its 760-acre campus south of Fort Myers. College of Arts and Sciences offers a Bachelor of Arts in Liberal Studies, with concentrations that include Environmental Studies and Earth Systems Science. The Region in which the University will be located combines rapid population growth in a geographically constrained area, the Gulf of Mexico to the west and Lake Okeechobee to the east, with a unique and sensitive environment. The University, therefore, will be ideally suited to emphasize study of the environment. Building on a strong program at the graduate level, the University will have the opportunity to ultimately develop a center for environmentally oriented graduate programs and research. After 21 years now, we’ve reached a level of maturity in terms of our curricular programs, our research capacity, our people. It’s really about making our communities better, making our communities healthier, making our communities stronger, making our communities more prosperous.